Wow, it’s crazy how fast time goes by when you’re racing, racing, racing! 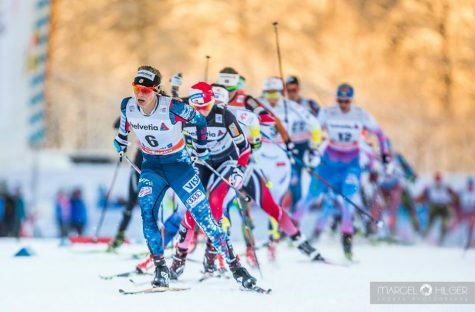 The Tour de Ski was such a blast this year, and I was happy not only with my own racing but in seeing the determination, grit and mental strength of my teammates and our staff! 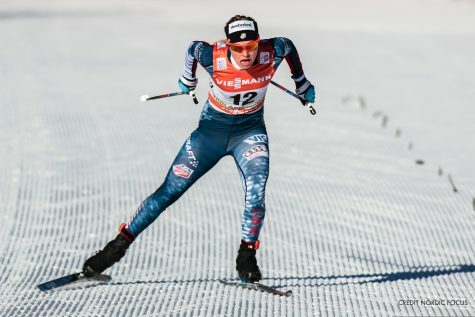 The Tour is no joke, and it takes some serious commitment to get out there early every single day, testing skis, sprinting up the testing hill about a million times to do glide outs just so us racers can have our best shot! A huge, huge thanks to our awesome support staff for sweating and smiling their faces off and making it possible for us to compete! As an athlete, it also take some awesome powers of self-delusion and positive thinking (maybe a 50/50 mix) to convince yourself that you’re not really that tired, you can go out and hammer day after day and if your legs feel dead, well…that’s just par for the course! EVERYONE’S legs are feeling dead, silly goose! After coming into the tour feeling good but fairly unsure of where my fitness would realistically stack up, it was a big surprise (but of the most welcome kind!) to find myself still near the front during the 10km skiathlon in Oberstdorf. I remember thinking to myself, “wow, ok, you really do have a shot to win this thing! Your skis are amazing, and your body is still feeling good. Start thinking like it’s yours to win!” And I gave the sprint out at the end my best shot, and to finish 2nd was such a fun rush! 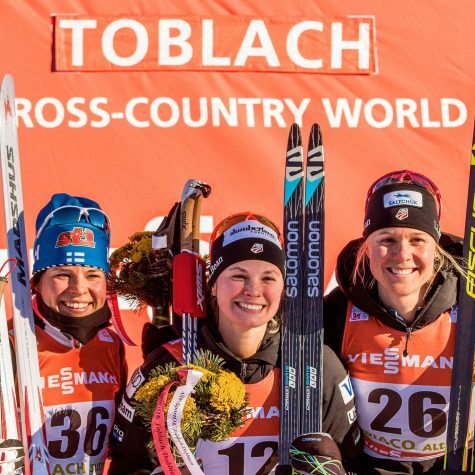 But however fun it may be to step onto the podium (and receive the biggest wedge of cheese you’ve ever seen in your life), it’s nothing compared to how happy I felt stepping up there with my teammate, Sadie, after the 5km individual skate in Toblach a few stages later! Seeing her up there made me cry, I was so happy. 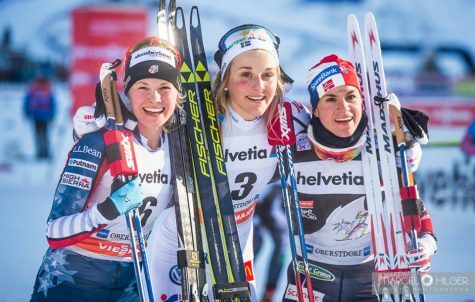 We always say “we train together, and help each other get faster, so when one of us succeeds we know that it was the team that helped them get there…and if one of us can do it, everyone else can, too!” but to see it actually happening was the happiest moment of my winter. The entire team took pride in that day, because it takes such a group effort, and it was great to see the coaches and techs getting recognized for all their tireless efforts! Then, of course…the last stage. The climb. Let’s just look at the course profile for a quick second…. 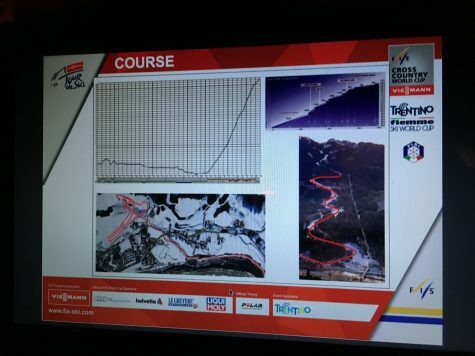 Course profile in upper left hand corner. Ok, done laughing? Nope? Ok.
Alright. Back to the blog. I would say that it’s all in your head, but…it’s in your legs. Your lungs. Your arms. Your feet. Your core. It’s painful, and it’s everywhere. But it only lasts 35 minutes. And the feeling of staggering across that line in the snow at the top, once you’ve regained full consciousness, is the best feeling of accomplishment I’ve ever known. Because you’ve just done something so tough that most people in the world can’t, or won’t, do it. And it ain’t pretty, but you’ve made it! Personally, I liken my appearance in the final 300 meters to a rag doll, but someday I’ll be able to pull that together. What I’ve got now is the guts to go for it and that’s what’s most important! After a day off to recover in Predazzo, the awesome little town we stay in near the venue in Val di Fiemme, we packed up our bags and went for an awesome easy cruise up on Passo Lavaze. They had 9km of man-made trails and it was so sunny and beautiful! Liz, Sadie and Noah skiing on the man-made strip. 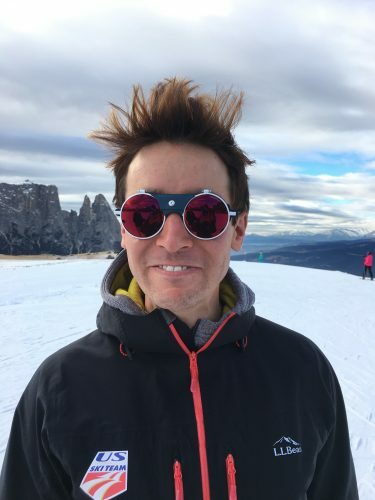 Speaking of sunny and beautiful, the place we went for our recovery training camp is very likely my favorite place to ski in the world. 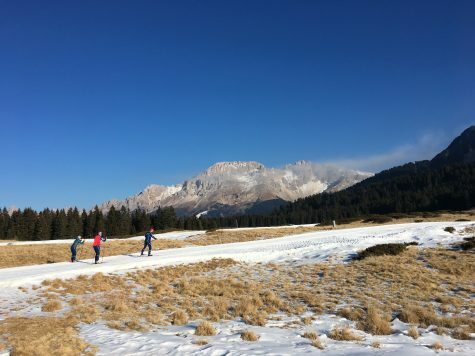 Seiser Alm, Italy, is up in the Dolomite mountains and while there was absolutely no natural snow this year (climate change is so scary) there is usually about 2-4 feet up in the mountains! 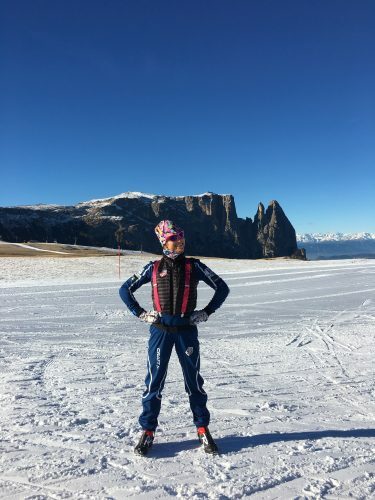 We stay at this awesome hotel up on the mountain and every day we would ski down to train on the 7km out and back of man-made trail they made for us. 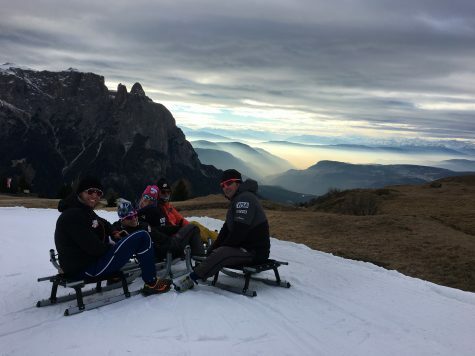 Liz had her 30th birthday up on the mountain, so we went sledding to celebrate! They have a 2.5km sled track that is groomed just like an alpine run, and it goes all the way to the bottom of the gondola from the top. Out of curiosity I wore my GPS watch, and found that we got up to 60.2 kilometers and hour! Yikes! Noah Hoffman made a great video of our camp, and in it he filmed the sled run – it’s pretty fun to watch! 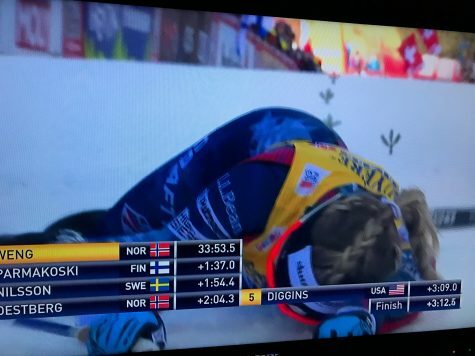 Check out the link to his video on my athlete Facebook page (Jessie Diggins) if you want to see what Seiser looks like. Now we’re on our way to Ulricehamn, Sweden. This venue is new to the World Cup which makes it really exciting!